Aerial view of Panching Limestone Formation: (from top to bottom) Bukit Tenggek, Bukit Sagu, Bukit Charas, Bukit Panching. The formation is possibly the easternmost limestone karsts in Peninsula Malaysia. Spanning about a kilometre wide is a vast wasteland of limestone boulders, pebbles and ridges partially overgrown with bushes and grass. A large, 26 metre deep lake smack right a the middle of the rocky terrain is all that is left of Bukit Panching, a 134m tall limestone outcrop overlooking it's larger sister mountain, Bukit Charas. Located 25km from Kuantan, on the East Coast of Peninsula Malaysia, these 400-million-years old karsts are part of the Panching Limestone Formation. 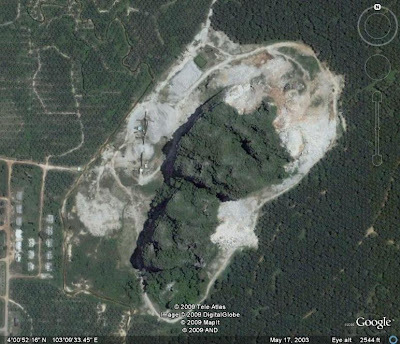 Bukit Panching is the very first limestone outcrop in the peninsula to be wiped out of existence. 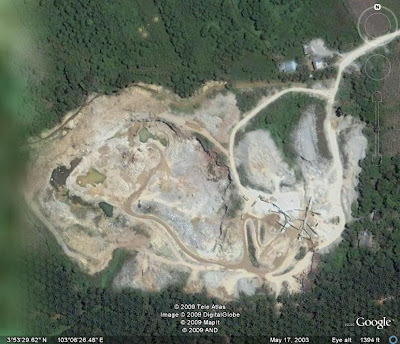 Managed by the now defunct Pancing(sic) Quarry Sdn Bhd, the last outcrop was flattened in the 1990s which then led to a continued quarrying of subterreanean limestone until a 26 metre depression was made. 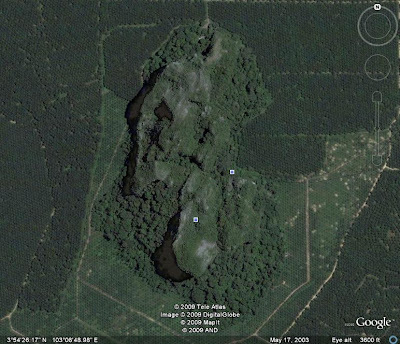 Bukit Panching (Google Earth year 2003 image)Seen here are pools of water collected on the southwestern area which has now became a large lake covering the 26m depression. The destroyed Bukit Panching (foreground,lake) with Bukit Charas as its backdrop. With that, countless endemic flora and fauna also disappeared. That includes molluscan casualty Opisthostoma (Plectostoma) sciaphilum (Benthem Jutting 1952), a microsnail that only inhabits Bukit Panching's rocky crevices. Endemic flora like Monophylla hendersonii and Emarhendia bettiania (both now restricted to Bukit Charas) also disappeared from the hill. And due to lack of research done on the hill's ecology, there might in fact be more casualties. Bukit Charas: a 355m tall limestone massif with a forested valley in the centre, it is located several kilometres north of Bukit Panching. To the north is Bukit Charas, an almost intact limestone hill with plenty of rare and endemic flora ie: Ardisia suffruticosa, Epithoma saxatile, Begonia ignorata, Monophylla hendersonii, Emaehendia bettiania, Tectaria cherasica, and many more. The molluscan fauna is also quite interesting, with plenty of microsnails belonging to Opisthostoma (Plectostoma) sp. , the newly described Notharinia linnei (Vermeulen, Phung and Troung 2007)and other diplommatinids. There're also unidentified Phaedusa sp. and Macrochylamys sp. . Fortunately, the presence of a Thai-Buddhist Cave Temple in its northern cliff has prevented it from being a target of limestone quarry prospectors. The snails found in self-collected soil samples of Bukit Charas: (from left to right) Macrochylamys sp., Alycaeus cf. perakensis(? ), Phaedusa sp. fragments and various microsnails. The endemic Monophyllaea hendersonii living on limestone surface near the stairway to the Thai-Buddhist Cave Temple. Another endemic, Emarhendia bettiania, which lives on cliff faces in the same area. The easily identified Ardisia suffruticosa with its characteristic radiating leaves. This species is only known to occur in two localities, Sungai Tebrau,Johor and Bukit Charas, Pahang. Not so fortunate though, for the remote Bukit Sagu and Bukit Tenggek in the North. 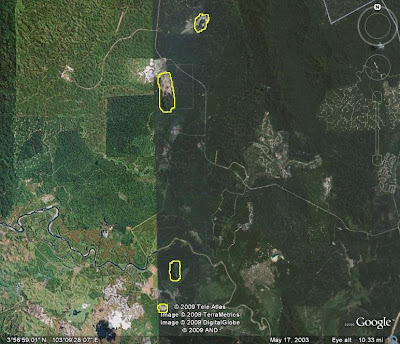 These two hills have been quarried extensively, 50% on Bukit Sagu and 30% on Bukit Tenggek. 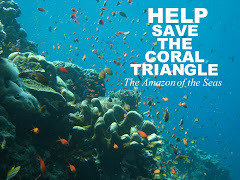 Bukit Sagu is expected to disappear within the next 10 years with Bukit Tenggek following suit. Little molluscan research was carried out on these hills, so the known snails are limited to a few like the Bukit Sagu endemic Opisthostoma (Plectostoma) senex (Benthem Jutting 1952)see pics. here and Alycaeus carinata (Maasen 2006)see pics. here. 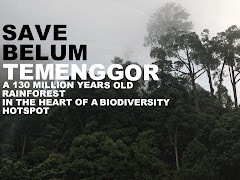 In fact, Bukit Tenggek, the northernmost hill, has so far escaped attention of scientists. In terms of flora, the only known endemic is Bukit Sagu's Paraboea bakeri. 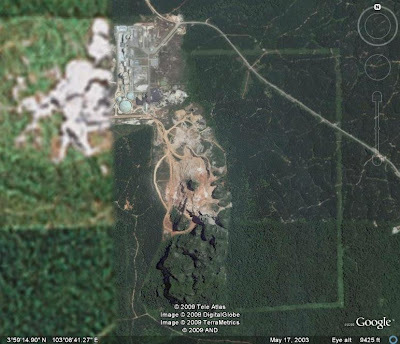 Bukit Sagu with the flattened northern flank and cement processing factory. The northernmost limestone hill of the Panching Limestone Formation, Bukit Tenggek. The Panching Karsts harbour many new-to-science flora and fauna and should be given more attention from the researchers and conservationists. 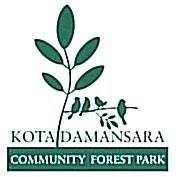 Although quarrying of limestone is unavoidable as this is the only closest limestone source for the city of Kuantan and the region's infrastructure developement, sustainable use of the precious resource will ensure that the wildlife and plantlife of these special hills remain intact for years to come. Hi JK, I am also a snail collector and Karst naturalist. I am concern about Karst destruction and snail extinction especially to Panching species. I had visited Charas Hill and found 27 species of landsnail inhibited at this area included Notharinia linnei. Do you noticed about the population of Opisthostoma charasense from the base of Charas Hill? Thanks for commenting. It's sad indeed that karsts biodiversity of Panching Formation keep suffering from limestone quarrying. I didn't find much snails during my visit to Charas Hill probably because I had only collected some soil for sampling. Most of the specimens belonged to Hydrocenidae, Trochomorphidae and Subulinidae. But I would be interested to know more about Opisthostoma charasense too.